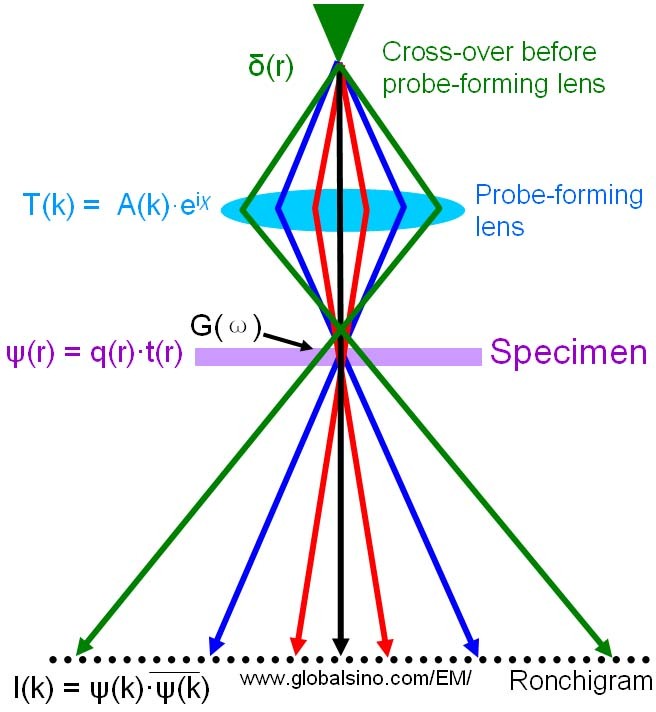 The TEM sample is usually described by a projected potential model where the atomic potentials will modify the phase (and only the phase) of the wave of the incident electrons as the electrons passes through the material, which is represented by the phase object approximation (POA). When the specimen is thin and thus the phase change is small, this model can be further simplified by the weak phase object approximation (WPOA), which is a linear approximation. For instance, assuming the projected potential of a thin specimen is provided by ϕ(r), the effect of the TEM or STEM specimen on the exit wave ψ(r) is to multiply the exit wave by a transmission function q(r) = exp(-iσϕ(r)) as shown in Figure 3703, where σ is the interaction constant. Figure 3703. Schematic illustration of Ronchigram formation.